Andrew Knightley: I haven’t had a drink for sixteen years Gary. Gary King: You must be thirsty then. British humor. You love it or you hate it. But I must admit that this movie pleased me after a while. The first 15 minutes you have to go through persistently because it seems to go nowhere and it looked like it would be a boring movie. But as soon as Gary King starts to get going it was tremendously funny and absurd sometimes. Some conversations were hilarious. The fact that he is suffering from a temporary memory deficit all the time. Also the camera-work began to surprise me with the special transitions and the way of filming. As more alcohol is consumed, the conversations were even more absurd. And then it went for me beyond the limit of the absurd into utterly ridiculous. The moment the “as ink pots filled” alien duplicates appear on the scene and were beaten to shreds by the four bar pendants, the level dropped a bit and it was all a bit too surrealistic. It was like a flashback to a Dr.Who episode on television years ago. The aliens who appear to have swallowed a flashlight look totally crappy and ridiculous. The only thing that retained were the absurd conversations of the roguish 4. 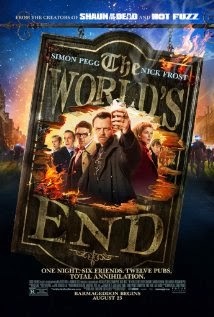 And thus I still do find it a palatable film by Simon Pegg and his companions.